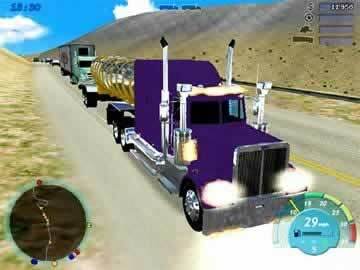 18 Wheels of Steel Convoy Game Review - Download and Play Free Version! Unique combination of a driving and strategy game. Next to real life graphics add to the game experience. A variety of loads (gas, corn, cars) to haul and places to take them (U.S., Canada and Mexico). Travel can be too time consuming. Truck can become stuck with no way to reset it. Here's your chance to take command of the highway with a huge convoy of trucks! Feel the road rumbling under a whole lot more than 18 wheels as your convoy speeds through more than 40 cities from one coast to the other and from Mexico to Canada to complete jobs and transport loads. Enjoy another installment in the 18 Wheels of Steel simulation trucking series! Start with a single truck and bid on jobs to gain a good reputation. Then it's time to bring the intensity as you build a bigger fleet of trucks with more than 35 choices of rigs and trailers and bid on much more challenging jobs involving more than 45 types of cargo! Make sure you don't fail a job or pass up an important job or your reputation may hit rock bottom. Speed down the highway but watch out for the police because they are just waiting to take down a huge convoy like yours! Gamers of all ages will enjoy driving trucks and making virtual money from successful jobs. Kids can learn where different cities are and experience driving their own trucks while adults can enjoy the exciting escape from real life and the economic strategy required. 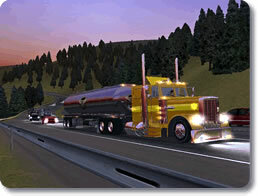 Hop into the cab and start haulin' now for some exciting trucking fun! 18 Wheels of Steel: Convoy lacks the different modes of play that others in the series have, but makes up for it in the large amount of vehicles and upgrades available to unlock. This game uses amazing attention to detail to create the most lifelike truck driving experience imaginable. You will be picking up and dropping off loads, refueling and even stopping to weigh your truck(unless you took the extra weight). Watch out for the police along the way, because if they catch you doing something wrong they'll slap you with some hefty fines. Using a unique blend of driving and strategy, 18 Wheels of Steel has you managing your own trucking company as well as being the driver. In this version of the game only one mode of play exists, the free play mode. In free play you are the driver of your own truck. With the assistance of your manager you will be hiring new drivers and picking up loads to drive all over the country and even to Canada and Mexico. When you go into foreign countries you must pass through customs, just like in real life. Upgrading your truck is also an option. You can buy bigger engines, a better transmissions, stronger brakes, and even paint the exterior of the truck. 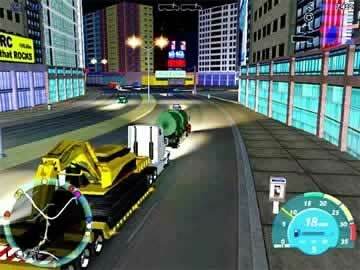 Most of the game will be spent on the road delivering goods. That being the case, the well done graphics add a bit of realism to the game. Every detail is carefully crafted down to the occasional critter running across the road in front of your truck. The highways are all correctly named and placed , but lack street signs so navigation can be difficult. The cab view of the truck shows the dash, gauges, steering wheel and even your rear view mirrors. The level of detail achieved in this game is astounding. A few minor drawbacks exist in this game, but if you are prepared for them it won't be a big deal. First, there is the issue of how long it takes to get around. Even some of the shortest city-to-city distances can take upwards of 15 minutes. A cross country haul can set you back more than an hour. The trucks move at relatively slow speeds so long hauls can get boring. The second drawback is getting stuck. If you manage to get your truck stuck, there is no way to get it unstuck. This means you have to revert back to your last save point and start over again. Saving frequently will reduce the amount of tasks you will have to repeat. 18 Wheels of Steel lets you experience what it's like to be a long haul truck driver without ever leaving your couch. Picking the profitable loads and keeping everything nice and legal are just a few of the challenges you will face. Don't forget to invest in some upgrades so you can get your load to its destination as fast as possible. When you sit down to play just be prepared to invest some time. This game is a great way to kill some time and see some of the virtual countryside. Check out some of the long haul action in 18 Wheels of Steel Convoy.